Say 'I love you' with gorgeous flowers this Valentine's Day! Teleflora has a beautiful selection of bouquets and gifts, perfect to share with your loved ones this season. We're teaming up with our dear friends at Night Helper Blog to give readers a chance to win a $75.00 Teleflora Gift Code! You definitely don't want to miss this giveaway! I would treat myself! I t has been a very long time since I got flowers. I'd send this to my aunt. I would send some flowers to my mom. I would give flowers to my daughter. 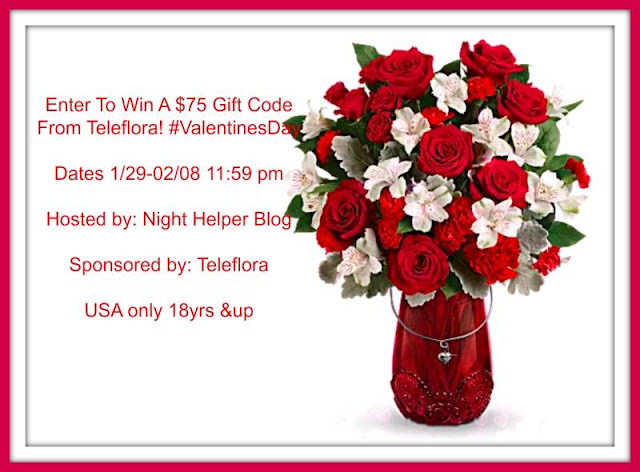 I would gift this Teleflora Bouquet to my Mother. Thanks for the chance to win such an amazing giveaway.